Mar - 06 | By: Green Production | one comment. 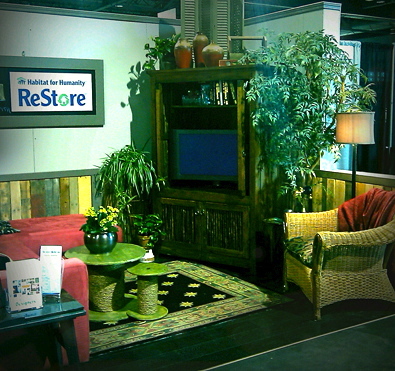 ReStore, a Habitat For Humanity division, can be found nationwide and is open to the public. They sell an enormous variety of reclaimed building materials; everything from doors and windows all the way to the proverbial kitchen sink. The proceeds from our local stores go to Habitat for Humanity to help build homes for needy families right here in Oregon. Why am I telling you all this? Well, we recently met with the folks that run the Portland ReStores. They are interested in reminding the film, TV, commercial and theater communities that they are open for production business. They want to talk to you about recycling and reusing certain set pieces, props and even production office furniture etc. ReStore accepts a huge variety of items; hardware, lighting, lumber, paint, siding, sinks, roofing, tile, tools, windows, appliances, cabinets, doors, flooring, furniture, and more. (The ReStore’s complete donation guidelines can be seen here). They are even willing to talk to productions about studio pick ups for bigger, end of shoot donations of materials. Going hand-in-hand with this of course, is the huge variety of potential set pieces, props and production office furniture for sale at a fraction of the cost of a regular retail store. So, art department and construction folks, if you haven’t already, check them out, give them a try and do a good deed for the environment too! For more Oregon specific green resources go here.